The Bobcat™ is a bolt-on, bar-mounted accessory fairing with a tough polymer lower section and a durable Lexan® polycarbonate windshield. Mirrors are included. 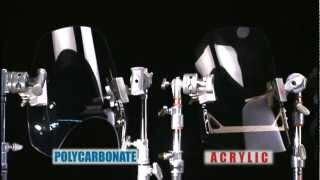 The lower section of the Bobcat™ ATV Fairing is molded from a tough, black plastic polymer to withstand rugged terrain use, while the clear windshield is durable Lexan® polycarbonate with a protective rubber outer trim. 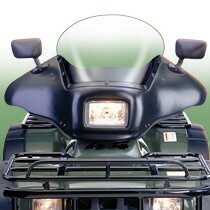 Rear view mirrors are included with our Bobcat ATV Fairing. In many work and recreational riding situations, they offer a clearly visible benefit. Three part numbers will fit over 45 of the most popular ATV models.